Before you write there’s no way of knowing how you’ll react to rejection. It takes that in-your-face first form rejection letter to send your head into a spin of disbelief. Many years ago, I wrote a very bad first novel… When I sent it off, I naively thought it would be a best seller and made into a movie within a year. Imagine my dismay when I received the form rejection faster than I received the post card I had included for them to notify me that they had received my manuscript. I was devastated…. And, I was sure that some stupid editor had it all wrong. Hundreds of rejections later, I take it in stride now. I’ve learned several things about rejection that might help you to manage rejection easier. A rejection letter is one person’s opinion. Don’t shove your book or article into a closet on the basis of one person’s opinion. What if that person is wrong. Learn the nuances of rejection letters. 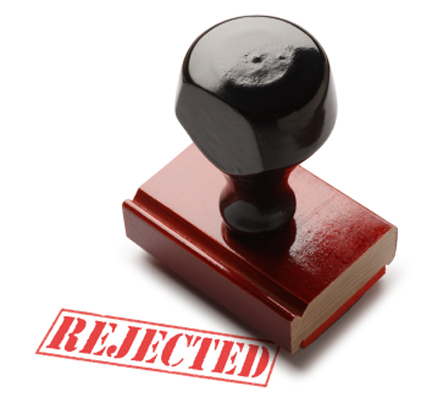 If you receive a form rejection letter or worse yet a form rejection post card, move on. Try another publisher or take a look at your manuscript, revise and send it out to someone else. If you receive a rejection letter that says, “This book is not for us, but send us something else,” be sure to follow-up and send them something else. Editors have too many manuscripts to read to send out idle invitations. If you receive a rejection letter that says, “We are not interested in this book as is. Fix …. and we’ll be glad to take another look,” celebrate. This is not a rejection. It is an opportunity. Make the changes, if they are in keeping with your thoughts on the book, and send it in. Look at the positive side of rejection letters. Assume that you will find a publisher eventually and greet each rejection letter enthusiastically as one step closer to finding that editor who will say YES to you. It helped me overcome rejection to make a list of publishing houses and editors I would send the manuscript to. Initially, I would send it to the first on the list and if a rejection letter arrived, I would immediately send it to the next. That way, while I was depressed about the rejection letter, my manuscript was out there working for me. I”m not saying I enjoy rejection. I’m saying that to move forward it helps to accept rejection as part of the process. I would truly wish for you a rejection-free writing career, but I realize that’s not going to happen. Just do your best work and remember that many of the best writers have been rejected multiple times. For some reason, we all need to accumulate a few battle scars before triumph. If you have a rejection story, let us hear it in the comments section. This entry was posted in writing general and tagged manuscript, rejection, writing. Bookmark the permalink.